As much as we enjoy our labours of love, the editing process can seem to drag on forever. Searching for that extra brightness on the vocal or the finding a home for the crunchy guitar are some of the more creative parts of the mix process. To arrive at the point where you’re creatively honing the song however, you must first get the drums in phase, clean up vocal takes and make sure your filing is in good order. This can be tedious, so it behooves us explore ways in which we can expedite the process. Some shortcuts may be no-brainers, but as the world of the Digital Audio Workstation is becoming even more approachable, self-taught DAW-ers can easily miss out. These are a few things to consider to cut down your time in the box. The way you approach organisation and efficiency in the box is, of course, dictated by experience and personal preference. Nonetheless, here are a few tips to help you cut down your time spend slaving away at your DAW. These are an obvious way to zip around your station without dragging your mouse around like a backpack full of bricks. It is a given that knowing what you’re working with will cut down time, and if you know how to switch tools and screens with your keys, it may be seconds, but it maintains the flow, leading to more effective work and consumption of your time. The shortcuts are usually next to the commands in their menu, but you can find them and study up through the help menu. The way I learnt them was choosing one to integrate per project until I knew all that would help me without having to think. If you’re experimenting with multiple DAWs, this may annoy you as of course they aren’t skills that are transferable between each program, so some keyboard shortcuts are mixed up or non-existent. But even knowing a few – like switching between cutting and moving tools – can help, so learning them as you go would be beneficial! One of the most painstaking activities in the mix is setting up complex automations by hand – dragging and placing dots to change infinitesimal parameters. Some programs allow you to adjust how your track changes as you listen to it. In Apple’s Logic X for example, you can have your pointer over the left and right pan and little automation dots will map where you chose to make changes as the song plays through. This is especially helpful for any sound design or film projects that may require you to define space in response to visual stimuli. You may have to automate the pace of the volume of a sound as a character gets closer to the sound source. Stopping, starting, and matching visual components can be fiddly, but here you can make a realistic real time sound experience. As much a creative technique as a technical one, automating in real time can really cut out some of the work. DAWs that utilise a “write” mode or equivalent allows the user to fade in and out automation in real time. This is especially useful in riding reverbs and delays to create extra movement in a track with a human, musical touch. Engineers acclimated to working with a console will appreciate this approach, so incorporating a DAW controller into your setup is worth considering. The rookie mistake that sometimes foils the most seasoned sound artist can be avoided with a little attention and organisation. The first piece I ever created I lost all my files on the studio computer because I didn’t use a ‘Collect All and Save’ to my hard drive. Forgivable with my small knowledge of DAWs at the time, but on one of my more recent pieces I had named two projects similarly and imported the wrong samples so I had to spend hours relocating what was supposed to go where in an 8 part harmony when all the tracks were named Vox 1, 2, etc. That is just silly. While it may seem like a waste of time to name your tracks properly or get nitty bitty with keeping files organised, in the long run you will thank your past self. Start a naming system to differentiate between different projects – record with the track named ‘Instrument_Part_Projectname’ to easily find what you’re looking for wherever you go (or whatever fits with your working style). Make sure all the sound and working files go into the same place and are named identifiably. 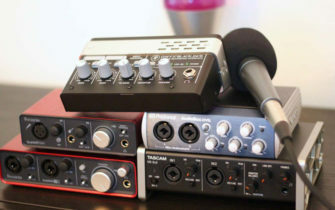 Order your tracks intuitively – you wouldn’t put the snare on the top of your work space and the kick on the bottom, so don’t separate bass and drums, or vocals and backing vocals; these are best friends and work off of each other. Bus tracks you want to be affected identically. Even use the colouring options most DAWs offer to differentiate parts and how they interact with each other – this may allow you interact more intuitively and creatively with your parts, ultimately saving you time. Taking these extra precautions could save you hours in tracking down lost files. Sometimes, no matter how much you play with a sound, you’re never going to get it where it could have started from at the very beginning of the recording process. There is certainly an art in encouraging the right performance out of your sound source to begin with, as well as miking them appropriately so as to get the intricacies or desired feel of the sound. If your drummer doesn’t play with a click track and you have to spend a lifetime beat mapping their mistakes, you will never make the mistake of neglecting the recording process to ‘fix it in post.’ Don’t settle with mediocre takes, and put a little extra time into recording to take a lot of time out of your editing. It’s worth acknowledging that the above words could be interpreted simply as good common sense in the studio, rather than specific DAW-based shortcuts. But if you’ve grown up as a DAW native, the mantras of sensible file organisation and appropriate recording methods can bear repetition. The DAW shouldn’t replace decades of accumulated best practice in the studio, it should enhance it. As you experiment with these procedures more and more you will pick up your own small ways to do things more quickly. A lot of experts probably wouldn’t be able to tell you how they move faster, as a lot of it can be attributed to experience. Starting off with these will get you well on your way, even if they only cut off a few seconds!